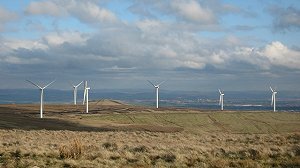 United Utilities and Peel Energy have submitted plans to Rochdale and Rossendale Council for the expansion of the existing Scout Moor Wind Farm by building 16 new turbines on the site. The site is situated above Rochdale and Heywood. The plans were submitted by joint venture, Scout Moor Wind Farm Expansion Limited, a new company owned by United Utilities and Peel Energy who have been consulting with local communities since 2014. Scout Moor is the second largest onshore wind farm in the UK with 26 existing turbines. Jon England, a representative from Peel Energy, said: “There have always been good reasons for expanding the existing wind far, such as a proven track record of high energy output and the fact we have an existing point of access. If the application for the 16 turbines gets the green light, they will have a total installed generating capacity of 104MW and will generate enough electricity to meet the needs of 20,000 homes per year. In addition to the erection of extra turbines, the submitted plans include the restoration of 3.5 square miles of peat moorland, a key part of the application, which will see enhanced levels of vegetation cover and biodiversity. The scheme is expected to bring in a number of benefits for local people, including a community fund to the value of up to £5m per 1MW per year over the lifetime of the project, as well as a community co-operative ownership scheme which will allow members of the community to own shares of up to two turbines on the project. Subject to approval, the extended wind farm is anticipated to be fully operational in 2017.